In 1283 Saint Philip, Prior General of the Friar Servants of Saint Mary, attempted to lead back to obedience to the Apostolic See the citizens of Forlì then under interdict. He was driven out of the city with insults and violence. While this true follower of Christ was praying for his persecutors, one of the crowd, an eighteen year old by the name of Peregrine of the famous Laziosi family, repented and humbly asked Philip for forgiveness. The holy Father received him with love. From that moment the young man began to scorn the vanities of the world and to pray most fervently to the Blessed Virgin, asking that she show him the way of salvation. A few years later, guided by the Virgin, he received the habit of Our Lady in the priory of Siena where he dedicated himself to her service. There, together with Blessed Francis of Siena, he committed himself totally to the Servite life. St. PeregrineAfter some years he was sent back to Forlì where, because of his love for God and Our Lady, he gave himself to the recitation of psalms, hymns and prayers, and to meditation on the law of God. On fire with love for others, he lavished a wealth of charity on the poor. It is said that he miraculously multiplied grain and wine during a severe shortage in his area. Above all else, he was outstanding in his love for penance; in tears, he would reflect on the errors which he thought he had made and would frequently confess to the priest. He afflicted his body with various forms of mortification: when tired he would support himself on a choir stall or a rock; when overcome by sleep, he preferred the bare earth to a bed. As a result of this type of life, at the age of sixty he suffered from varicose veins which degenerated into cancer of the right leg. 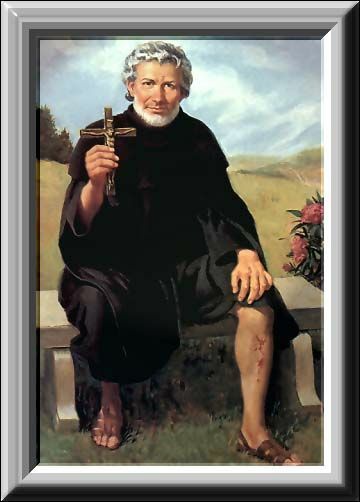 St. PeregrineHis condition deteriorated to the point that a physician, Paolo Salazio, who visited him in the priory, decided, with the consent of all the friars, to amputate the leg as soon as possible. The night before the operation Peregrine dragged himself before the crucifix in the chapter room. There he became drowsy and seemed to see Jesus descend from the cross to heal his leg. The following day, the doctor arrived to perform the amputation but could find no sign of the cancer, or even of a wound. He was so shocked that he spread the news of the miracle throughout the town. This only increased the people’s veneration of Peregrine. The saint died of a fever about 1345 when he was almost eighty years old. An extraordinary number of people from the town and countryside honored him in death. Some of the sick who came were healed through his intercession. His body rests in the Servite church of Forlì where it is greatly honored by the people. Pope Paul V declared him blessed in 1609 and Pope Benedict XIII canonized him in 1726.